For anyone, the pure beauty of the place is enough to make you want to go back time and time again. 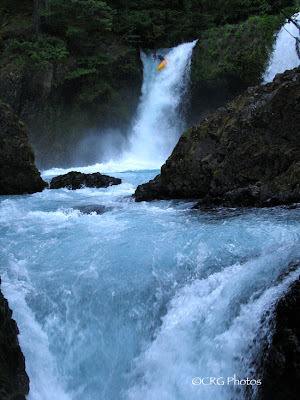 Fortunately for paddlers, the most efficient way to see this magical place is from a whitewater kayak. 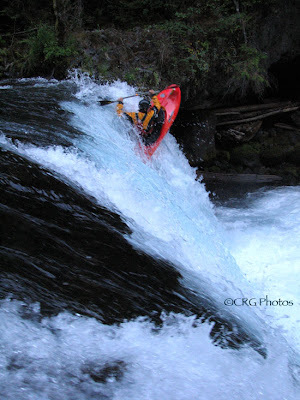 Since 1989 paddlers have been pushing the limits of what is possible in a kayak right here on this river. It is the perfect training grounds for class V paddling. 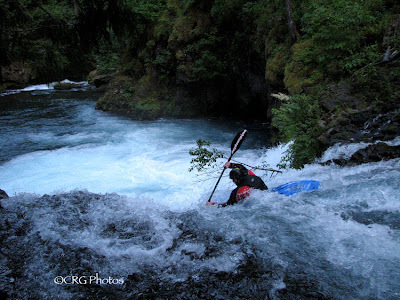 Whether that is personal achievements or paddle technics that are passed on to another paddler and carried to another river or just finding new and dynamic lines that push the progression of whitewater kayaking in general. This river has it all! 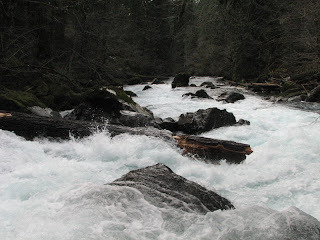 Easy access, short shuttle, boulder rapids, falls ranging from 10 to 33ft., and a canyon deep enough that it stayed clean of the industrial boom of dams built in the Columbia River Gorge. The put-in is at the first bridge that crosses the river, on the other side of the river from the USGS Lab in Cook, WA. Just downstream from Willard. 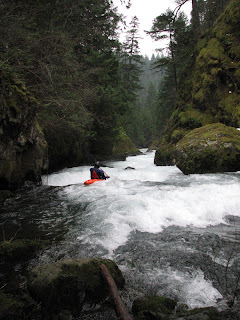 A 15 minute warm up on class 3 rapids abruptly ends at the top of Gettin’ Busy. Gettin’ Busy sets the stage for the Little White. This rapid tests you awareness for what’s to come. If your a little rusty, Gettin’ Busy will let you know just how much. 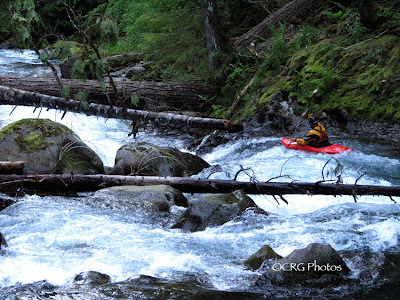 The rapid starts with the Oregon Slot, created in 2007, after a log jam flushed into the first rock drop (entry rapid) to Gettin” Busy. Since the first log jam more wood has collected year after year forcing paddlers into a narrow channel on the left that requires some technical low water rock paddling in order to not get pinned on the way through the slot. The top of Gettin Busy, have fun! The variation of lines that you can run in there is mind-boggling. There are many channels, most are good, some are not, but know where you are going in there before you drop into anything. Gettin’ Busy leads straight into Boulder Sluice. Island. The right side around the island used to be a good alterative (sneak line) to running the main line at higher flows, but wood has collected there in the past couple years. The left line (Main Island) is fast and steep with strong laterals. Read and run class IV leads into a set of ledges ending in Sacriledge, a sloping ledge drop with a perfect curling green tongue in the center. 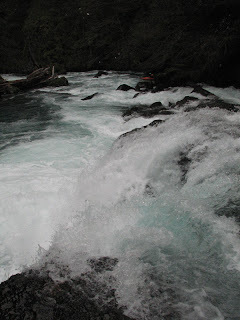 Sacriledge, like a few rapids on this river, has a cave up against the left wall at the base of the falls. At higher flows a rescue and gear retrieval becomes slim to none under the walls. 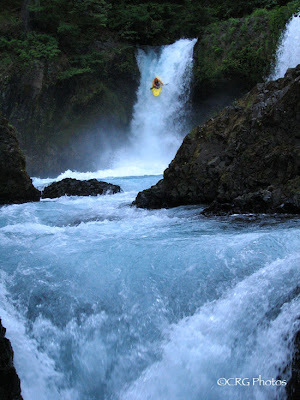 Downstream is Double Drop, a sloping double ledge falls dropping about 18′ together. 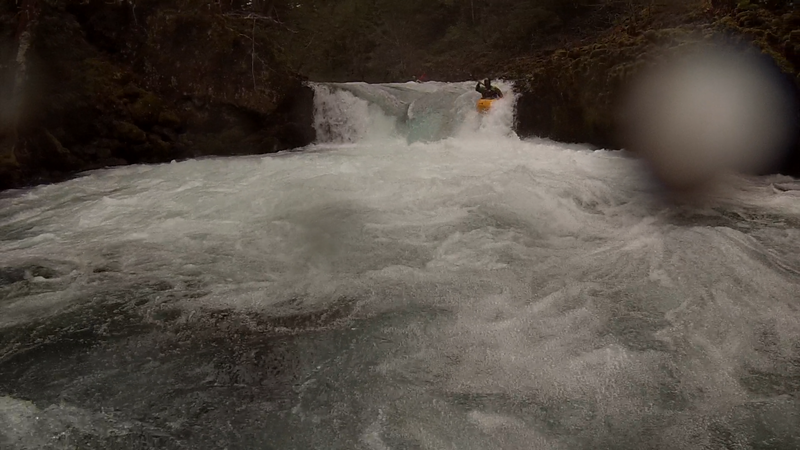 At higher flows the top hole can pack a big punch. In the run-out to Double drop is a fast paced curling left reaction wave called Typewriter. Read and run class IV leads down to the Enchanted Forest (right side of the island) above S-turn. The left side of the island (sunny side) can be run as well and it has a sliding bedrock character opposed to the boulder garden character of the right side. 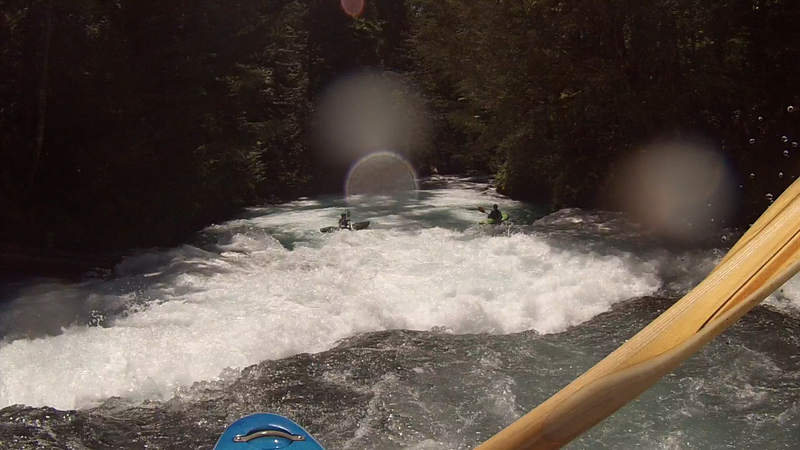 The left side is also the faster race line at proper flows. 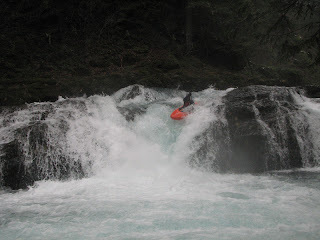 S-turn is a complex rapid, it drops about 12′ off a vertical shelf into a turbulent pool that pushes left and into a tight slot backed up by a powerful hole. The unnerving part is that the powerful hole is backed up by a pocket cave in the left wall where most of the water pushes. Scout this one very well. The right side is commonly run in order to stay away from the left wall at the exit. This is a great place to take a break at nearly the halfway point. Boogie water leads down to Backender. This double ledge rapid had wood blocking 90 percent of it forcing you to go had right against the wall. 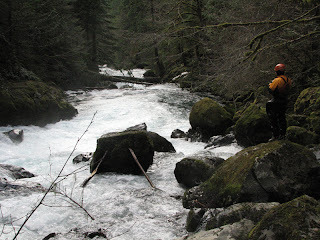 In the last couple years the massive boulder in the middle of the river rolled downstream and the logs are completely gone opening up another clean and classic rapid. Around the corner boogie water leads into Bowey’s Hotel, a boxed in ledge hole on the left. (Named after the legendary Bill Bowey). This hole can be more powerful than it looks. 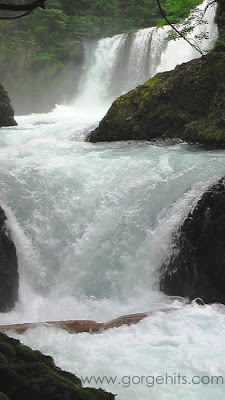 Just downstream everything slopes into Wishbone Falls and splits the river with the left channel opening up and plunging into a deep emerald pool. The right channel of Wishbone has been run a few times, but is currently full of wood. 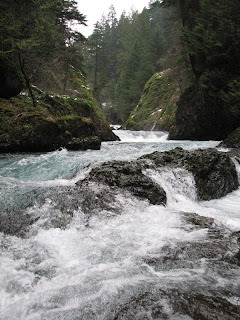 You are now in The Gorge where the water flows into a narrow pinch below Wishbone. Three ledge drops and Horseshoe ledge make up the narrow section. Horseshoe can get retentive especially at higher flows with Stovepipe not far downstream. As the canyon opens up it flows over Stovepipe. 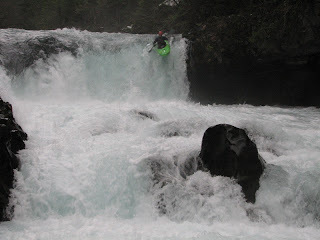 Stovepipe pours off in three channels with most of the water going down the center of the falls then against the left wall into a dangerous undercut. The right side offers more paddle strokes and avoids the undercut wall. Around the corner is Contemplation Canyon (The only piece of flat water on the run) which drains into some really fun waves and off of the Ski Jump. 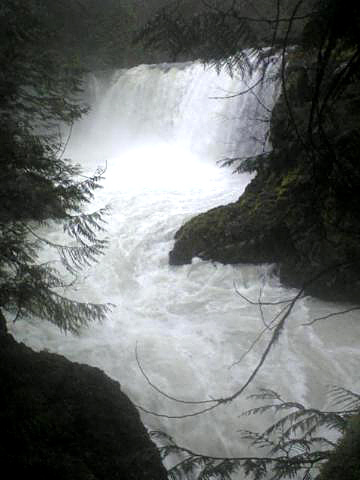 Spirit Falls is just downstream. Out of all the photos and video you have see of this drop nothing compares to seeing it for your first time. Spirit pours off about 33 feet into the cauldron below. 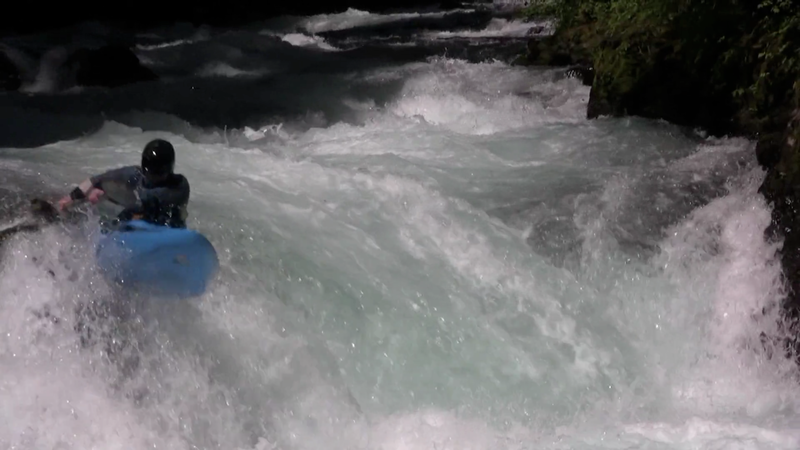 The Spirit Falls and Chaos combo is one of the best sets of rapids I have ever run. Chaos is a tricky 8ft. ledge with a nasty keeper hydraulic against the right wall. Below Chaos is rapid that contains a lot of logs against the left wall. It looks inconspicuous, but stay to the right and away from the logs. More read and run leads down to the backwards ledge (go with a local..) then down to Master Blaster. One last bang before the Little White lets up. Master Blaster has several lines, the most common is down the left, staying left of the big boulder. Immediately below Master Blaster are a series of concrete weirs. Be aware of these at higher flows they create terrible hydraulics! At the end Drano lake calmly brings you down and back to your car. What more could you ask for? 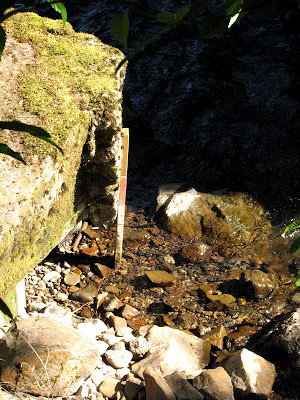 Flows: The water level is measured at the put-in on the gauge stick under the bridge on the river left side. The bottom of the stick reads about 2.7ft. which is in the low range. From there up to about 3.2ft is the low end. 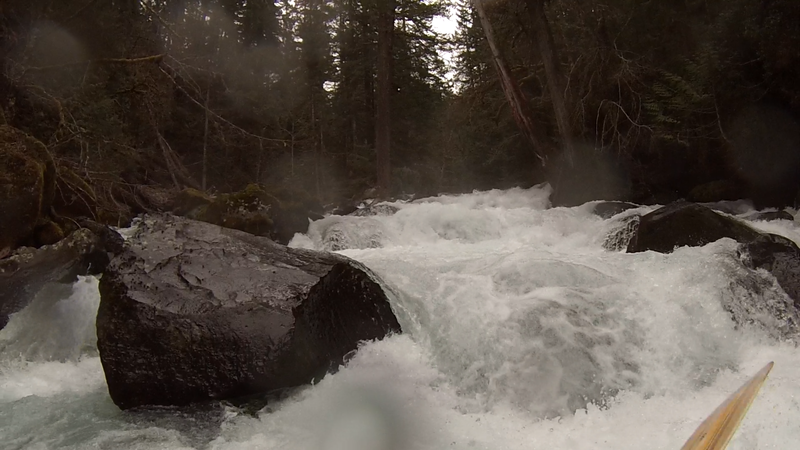 From 3.2 up to 3.8 is a good medium flow (Note that at about 3.6ft you start to feel a solid push from the river). 3.8ft and up is in the high range. 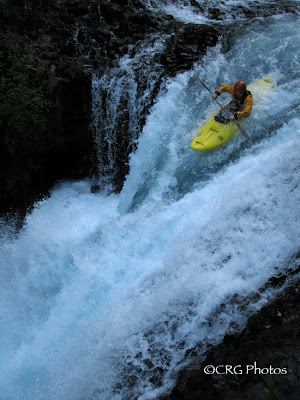 About 5 years ago not many paddlers put on above 4.5ft. Since then the top paddlers in the sport today have been pushing the levels up as high as 5.2ft. The river becomes a different animal above 4.0ft. 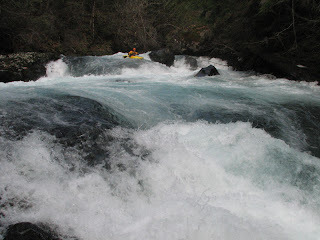 Be very careful at high flows. 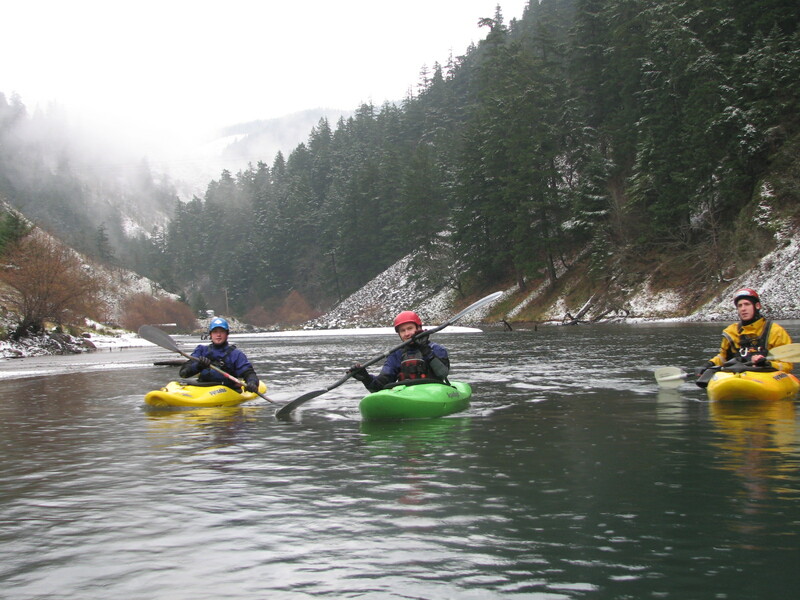 The Little White Salmon River is located in the crosshairs of the Cascade Mountains and the Columbia River. Extreme winter conditions occur during the start of the season. Beware of ice in and along the river. If you know the run it can take less than an hour to run. If it’s your first time without a guide it could take all day. An easy way to start remembering rapids in there is to memorize the lead-in rapids. Every major rapid has a lead-in rapid.